It’s been a while since our last update. But hopefully this was worth the wait. 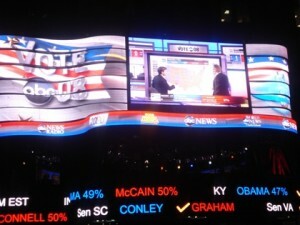 To start off, the memorable election theme that ABC News used in 1996 and 2004 has been added to the website. You can now also listen to ABC’s custom version of VideoHelper’s Presidential Persuasion theme that is probably most closely associated with the 2008 elections. World News’ headline cue is derived from that theme and has also been added. Two news magazine themes have been added to the website. Street Stories was an early 90’s show hosted by Ed Bradley on CBS. And Would You Fall For That? was an ABC show featuring psychological experiments that aired last summer. The network news divisions also produce radio broadcasts. The theme ABC currently uses for its hourly news update is now online, as well as the legendary sounder CBS used for many, many years. Some older themes we added as well: ABC News Business Brief and Issues & Answers, which was the show that preceded This Week. Finally, some themes that were already on the website have been upgraded with better cuts. ABC’s current World News is an example: both the full close and open are now available for you to listen to. 3 notes sounds incredible while announcer says you’re watching cbs news.what instrument played. times played 7:25 8:15. only last about 5or6 seconds.wish lasted longer can raise hair on arms.violins i’m guessing.